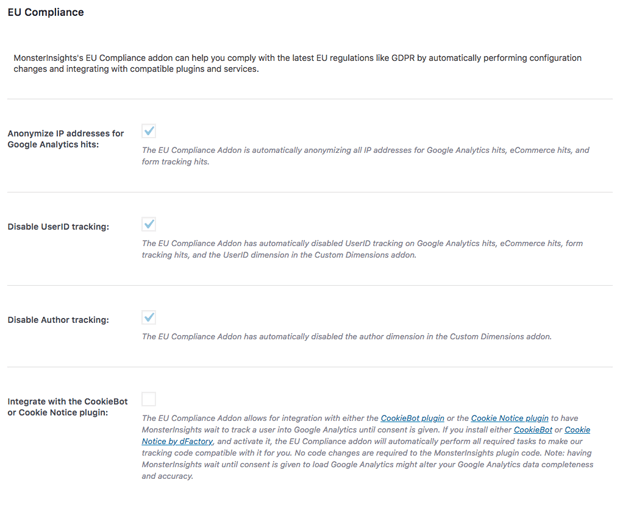 European data laws like the Cookie law and GDPR can make it difficult to understand how to make your site in compliance, particularly when it comes to analytics. So we created a simple addon that automatically takes care of the vast majority of the configuration changes required to save you valuable time and integrated with 2 of the more popular cookie consent plugins for WordPress, in a way that requires no confusing settings and no difficult to implement code changes. While the settings page is available in the Tracking tab, everything works out of the box automatically, and there’s nothing to be configured.